Rafael Devers and his Portland teammates gave the newly re-branded Rumble Ponies a rude welcoming in their first trip to Hadlock Field. Devers was 3 for 4 with a double and three RBI, and he has an extra-base hit in each of his first three games. Cole Sturgeon had his third straight multi-hit game, bringing him to 7 for 14 on the young season. Jacob Dahlstrand got the win, allowing three runs in five innings, while Ty Buttrey struck out three in 1 1/3 to pick up his first save as a professional. Despite a roster currently depleted by injuries, Salem dominated on Monday night. 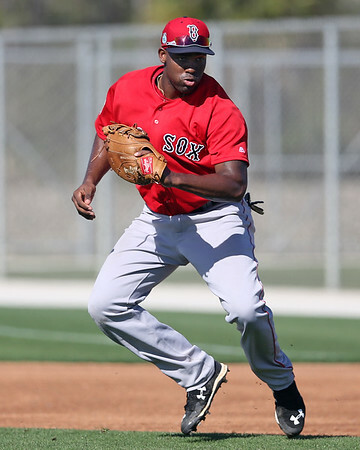 As SoxProspects.com Executive Editor noted, the Sox currently had three top-30 prospects on the disabled list. Josh Ockimey (pictured, right) reached base four times, going 3 for 4 with a walk and a triple, scoring twice. Big right-hander Dedgar Jimenez was excellent on the mound, scattering four hits across six shutout innings, striking out five against two walks. Austin Glorius and Bobby Poyner combined for three shutout innings of relief to seal the win. It was certainly not the way Jay Groome envisioned his 2017 would begin. The 18-year-old lefty allowed nine runs on seven hits in 1 1/3, including a first-inning grand slam. More significant than the result was when Groome left, seemingly begrudgingly, with the trainer with one out in the second. As noted above, the early prognosis is a lat injury. Keep visiting SoxProspects.com for updates on information on Groome. The injury overshadowed the subsequent play, but Ryan Scott continued his scorching start with his third home run of the season. Scott's three-run blast gives him 11 RBI in five games. Player of the Day: Salem may have been playing with a shortened roster, but its top position prospect took matters into his own hands. Josh Ockimey has a robust .444/.522/.722 line through his first five games, going 8 for 18 with four walks. Ockimey gave a long interview to outgoing SoxProspects.com Managing Editor Matt Huegel in Spring Training, where he talked about the adjusting to the long season with Greenville after his hot start last year, and how he prepared in the offseason to prepare to sustain that success for a full campaign.